His father served as parade marshal in 1971 and 1978. 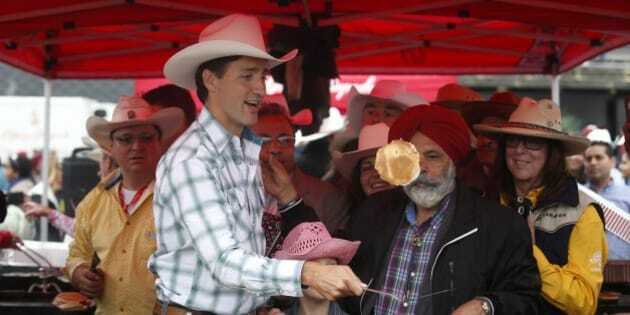 CALGARY — Justin Trudeau is no stranger to the Calgary Stampede but today's visit will be his first as prime minister. Trudeau is expected to kick off the day by attending the Stampede breakfast, and plans in the afternoon to take in some rodeo events. The prime minister has been attending the annual event since he was a small child — his father, former prime minister Pierre Trudeau, served as parade marshal in both 1971, months before Justin was born, and 1978. In addition to flipping flapjacks and watching cowboys, Trudeau will also join Alberta Premier Rachel Notley to make a funding announcement about the southwest Calgary ring road. They will be joined by Calgary Mayor Naheed Nenshi and Chief Roy Whitney of the Tsuut'ina First Nation, which will partner with real-estate developer Canderel to build three business centres along the road. The band says the multibillion-dollar project will have a major, long-term, positive impact on Calgary and the First Nation. The southwest portion of the ring road is scheduled to be done in 2021.